Comhghairdeas le gach einne a cheannaigh leabhar ag an Aonach Leabhar! 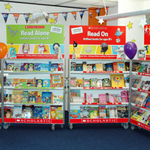 (Well done to all who purchased books at the Book Fair!) Bailiodh €8,880 ar fad. Gheobhaidh an scoil 60% = €5,328! ar ais o Scholastic chun leabhair a cheannach don scoil(Gaelscoil Ui Riordain will get 60% (€5,328!) towards buying new books for the classrooms & an leabharlann). Mile buiochas le Coiste na dTuisti faoi stiur Fiona a thug tacaiocht iontach duinn. (Many thanks to Coiste na dTuisti under the guidance of Fiona who gave their time willingly during the week. Maith sibh go leir! (Well done to all! ).